Wells Fargo Invites the Easter Bunny! A New Leaf’s La Mesita Campus, comprising La Mesita Apartments and La Mesita Family Homeless Shelter, welcomed 80 volunteers from Wells Fargo this week to celebrate Easter with our La Mesita families. 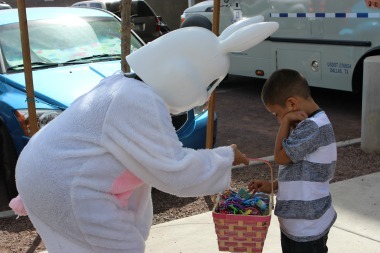 The day was filled with stage coach rides, arts and crafts, an egg hunt, games and other activities. The official bunny rabbit from Wells Fargo joked with the kids and took pictures with the families. A New Leaf’s grand opening for the La Mesita Family Shelter is April 15, 2015. For information, please call 480-464-4648.